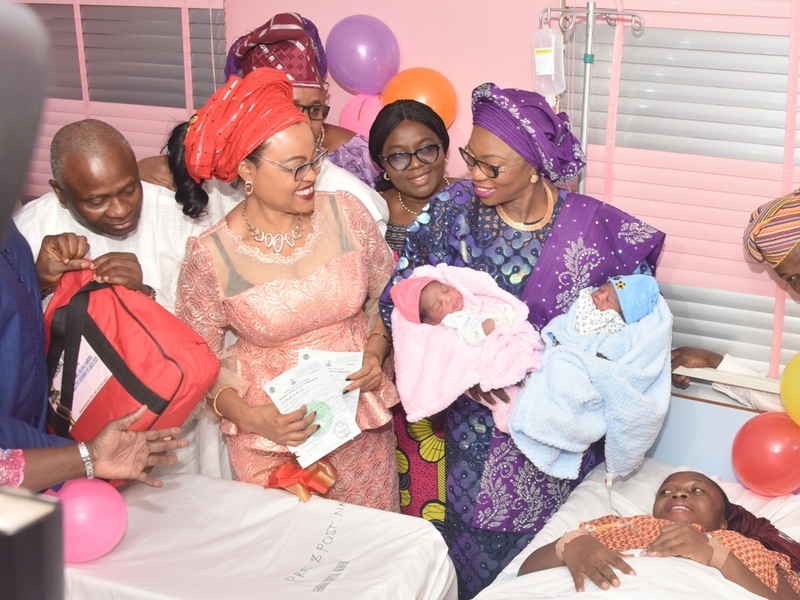 Wife of Lagos State Governor, Mrs Bolanle on Monday underscored the importance of routine immunization and post-natal care for the survival and growth of newborns, saying it was important for nursing mothers to pay greater attention to the health of their children. 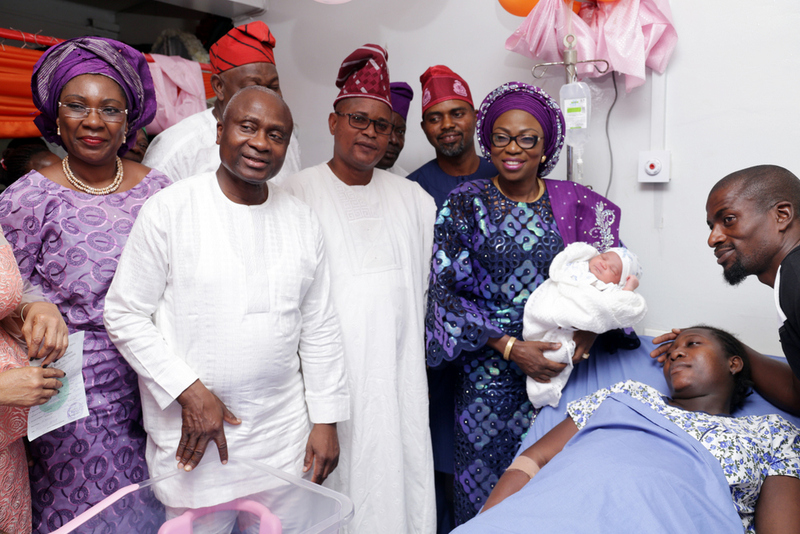 Wife of the Governor of Lagos State, Mrs. Bolanle Ambode with first babies of the year (3rd left); Commissioner for. Health, Dr. Jide Idris (2nd left); Chairman, House Committee on Health, Hon. Segun Olulade ( left); Federal Commissioner, National Population Commission, Barr. Bimbola Saliu-Hundeyin (middle); Medical Director, Ikorodu General Hospital, Dr. Olufunmi Bankole (3rd right) and parents of the babies during the presentation of gifts to the first babies (twins) of the year, born 12:23am and 12:24am, weighing 2.9kg & 3.25kg respectively, at the Ikorodu General Hospital, on Monday, January 1, 2018. She also advised expectant mothers in the State to justify government’s huge investment in maternal and infant health care by staying away from quacks and patronizing government’s health care facilities. 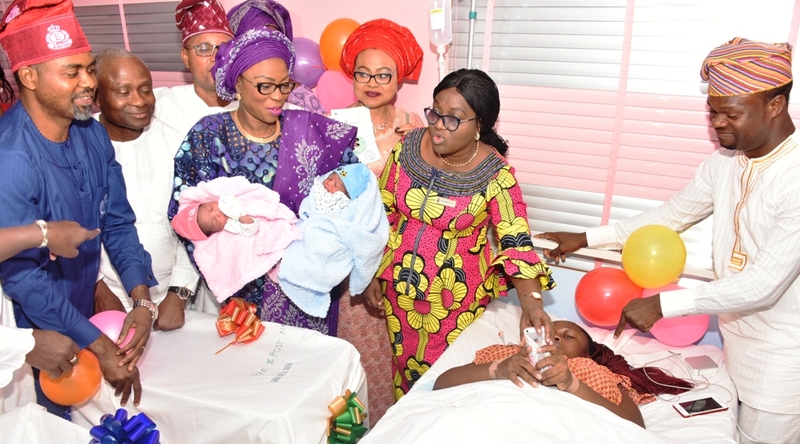 Speaking while presenting gifts to first babies of the year at three General Hospitals in the State, Mrs Ambode said just like the new year, the birth of a new baby brings hope, and such was why adequate care must be accorded newborns. According to her, “The arrival of a new born generally symbolizes passing the baton to the next generation. In our culture as in many others, a new baby is a messenger of hope, indicating good fortune for the family and society. “From the depths of my heart, I congratulate and rejoice with the happy parents. As I do so however, I wish to emphasize that post-natal care of the baby is just as important as the ante-natal. “Therefore, mothers must take all necessary steps to ensure the well-being and good health of their babies. These include strict obedience of instructions of the medical personnel, as well as good care and attention to themselves,” she said. The wife of the Governor specifically urged nursing mothers to take advantage of the primary healthcare centres provided by the State Government to ensure full complement of routine immunization for their children, and as well make good use of family planning. Mrs Ambode said she was aware of the fact that the present administration in the State placed high premium on health issues especially maternal and infant health, saying that as part of contribution to health sector, the Committee of Wives of Lagos State Officials (COWLSO), a group which she chaired, provided high dependency units, neonatal care units, and other medical equipment and resources to enhance the quality of maternal and child care services, assuring that more would be done in 2018. She also commended the health family in the State for the progressive improvement in health service delivery to the people, just as she appreciated corporate donors, philanthropists and Non-Governmental Organizations for their support. “We also commend the unitring commitment of this administration to continous infrastructure upgrade, provision of modern equipment and human resource development in the health sector,” Mrs Ambode said. In his remarks, Commissioner for Health, Dr Jide Idris said the event was symbolic being the first activity of government in the year and also exemplifying the priority given to healthcare delivery in the State. He assured that with the exemplary leadership of Governor Akinwunmi Ambode, the State Government would continue to stimulate the required quality of health service delivery that is poised to address existing health gaps as well as challenges that might emerge in future. Besides, Idris urged the people to embrace healthy lifestyle, refrain from excessive alcohol, smoking and ensure their environment is clean. Also, Chairman, Lagos State House of Assembly Committee on Health, Hon Segun Olulada called for strengthening of the referral system to reduce pressure on General Hospitals, saying people should imbibe the culture of first visiting Primary Healthcare centres which have been repositioned in the State. He expressed optimism that the State Health Insurance Scheme billed to start this year will expand access to healthcare. The hospitals visited by the First Lady are Ikorodu General Hospital, Gbagada General Hospital and Lagos Island Maternity Hospital. At Ikorodu, the first babies were twins delivered at 12:23am and 12:24am weighing 2.9kg and 3.29kg respectively, while at Gbagada the first baby weighing 3.4kg delivered at 1:05am. At Island Maternity, the first baby was delivered at 12:05am and she weighed 3.3kg. Mother’s packs, baby essentials and other baby gifts were presented to the babies and their parents and other babies in the ward by the wife of the Governor. The programme is held annually in Lagos State to celebrate the first baby born in the state.